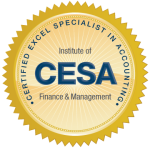 What is the IOFM Certified Excel Specialist in Accounting (CESA) Certificate program? With over 25,000 certified financial operations professionals worldwide, IOFM’s rigorous certificate and certification programs set the global standard for excellence in the accounting professions. Earning your Certified Excel Specialist in Accounting (CESA) certificate gives you a thorough understanding of the formulas and functions to give you the skills you need to do your job more proficiently in Excel. Whether you are just starting your path in AP, AR, or are a well-established professional, this program will serve you well as you advance in your career. You’ll learn to get your job done faster. You’ll discover that Excel isn’t a fast calculator, it is a platform that can be used to automate virtually any data-driven recurring task. Your training investment of both time and money pays off with high ROI. A now certified client who works for a CPA firm prepares an Excel financial reporting package each month for select clients. Each package used to take 40 hours per month to prepare. After applying the features, functions, and techniques they learn in this certificate program, the process now takes 4 hours per month. Available entirely online and on-demand, the program includes a comprehensive study guide, three volumes which cover different levels of formulations with each volume having a training video, a practice exam, and a 90-minute, 70-80 question exam (each candidate has up to three attempts to pass). Say hello to a brighter future in AP. Higher earning power. Our research indicates that certified AP professionals earn more than their non-certified peers. While your day-to-day performance says a lot about you as an individual, completing the training program and passing a rigorous exam proves that you have a firm grip on the core principles of the profession – and that’s a distinction that gets rewarded. Sharper skills. Certificate programs build skills – from the fundamentals to the advanced formulas you need to know in Excel in order to increase the proficiency in your role. More respect. You'll join an exclusive group of AP professionals whose skills are proven to meet a global standard of excellence. Receiving your CESA certificate increases your credibility and shows your peers, supervisors, and the public your commitment to your line of work. A stronger resume. Job searches are competitive, and it’s not easy to get your resume to the top of the pile. Certificate programs demonstrate that you’ve gone above and beyond to develop your skills and that you meet a rigorous training standard. For more information about this program, contact [email protected]. PS. Interested in getting your entire department certified? Team certification unifies your department, giving them the same core competencies and training to work smarter, not harder. Not to mention, you save more! Learn more about the benefits of departmental certification by calling 207-842-5557.